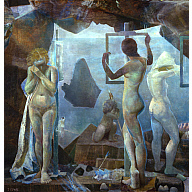 Cowie used surreal motifs - such as a picture frame acting as both a window and a picture - in this work, which is considered to be one of his most ambitious paintings. Cowie was interested in the technique of painting and studied the methods of artists such as Degas. He made many careful, preparatory sketches, in pencil or watercolour, for all of his oil paintings. Purchased in 1954 with income from the Macdonald Bequest. Arm and Hand - Study for "Two Schoolgirls"
Head Of A Schoolgirl - Study For "Two Schoolgirls"